Raspberry Pi enthusiasts keen on uniting Linux with their spanking new quad-core Pi 2 toy will be pleased to know that Snappy Ubuntu Core will run on it. The new $35 Raspberry Pi 2 single board computer is a drool worthy device for developers, innovators and hackers who no longer have to fret about resource constraints. “Ubuntu has been a key missing piece on our operating system support for the Raspberry Pi. We are looking forward to seeing what new things people are able to do with Snappy Ubuntu Core on the Raspberry Pi 2,” says Eben Upton, Founder of the Raspberry Pi Foundation. Still in beta, Snappy Ubuntu Core offers a minimal server image for clouds and devices. In the Snappy iteration of Ubuntu, the OS and application files are kept completely separate, as a set of distinct read-only images enhancing overall security and stability. Just in case you’ve arrived lately from Mars, Raspberry Pi is a credit-card sized computer that you can hook up to a regular monitor or TV. The cool little marvel works with a standard keyboard and mouse and whatever you can do on a PC (browse the net, watch videos, play games etc) you should be able to do without sweat on the Raspberry Pi 2. Until today, the Raspberry Pi device was constrained by the processor and memory. But with a quad-core processor and 1GB memory, a lot more can be accomplished with it now. 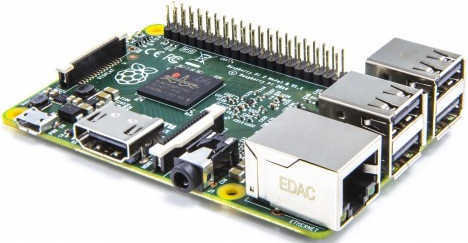 Raspberry Pi 2 is available at element14 and RS Components. I’ll pick up a unit when it hits Amazon.com in the U.S.